I found myself quite smitten with the looks Angie showed us with black ankle pants with black booties. Now that I have my Chelsea boots, I wanted to try the look but alas, the only black ankle pants I have are summer weight. So I tried to mimic the look by rolling my black skinny jeans. The outfit started with my black skinnies, cuffed twice. 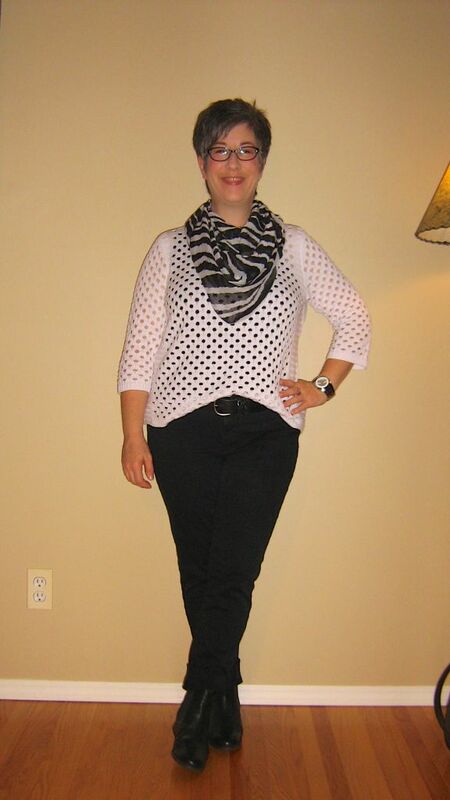 I then chose another Angie tip and paired a contrasting black tank with a white "hole-y" pullover (semi tucked). I then added a third Angie tip by pairing my black leather belt with my black booties…it's like an Angie Trifecta - three tips in one! Popped on my black Chelsea boots (good grief, I love these!) and then decided at the last minute to add a dose of black and white pattern mixing (I kind of think of the black tank/white hole pullover as a polka dot pattern) by tossing on my black/white zebra pattern scarf. Black/white specs, big silver chrome watch and silver ring, and my black leather satchel finish off the outfit. Question for you lovely ladies: did I get the cuff right to expose the booties? I tried one more for some bare ankle showing but then the cuff seemed too bulky. All comments/suggestions welcome. By the way Angie, the last shot is of the thin running socks I wear under my ankle boots. Thanks to Angie's tutelage, I have come to love wearing white - white jeans in particular. But I must confess to my love of wearing black and moody outfits and I know this will never change. So today's outfit is my homage to The Dark Side. I started with my ponte knit slim leg jeggings (why didn't I buy something like these before???) 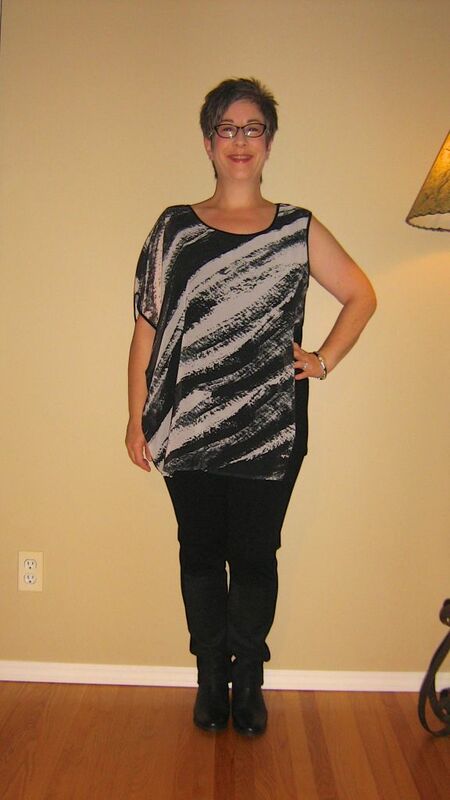 and added my newly eBayed grey abstract patterned silk EF tunic tank. Love at first sight - and feel! 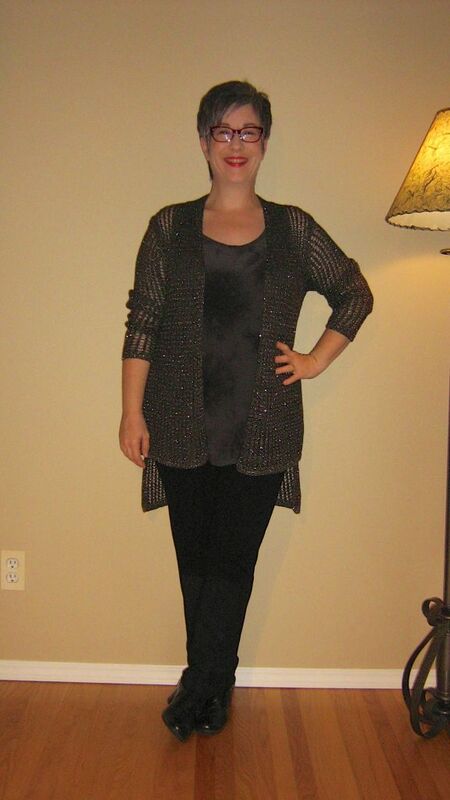 On top of that, I've added my EF sparkly bronze mesh hi-lo cardigan. I like to scrunch the sleeves on this cardigan to give it a bit more structure. I chose my trusty Clarks black leather shooties for footwear and then finished off the outfit with my black leather handbag, red specs and red lips. I don't wear jewelry with this cardigan because I don't want to catch anything on the mesh. What do you think? Does it all work together? I'll be wearing this trouser and tank combination with my black leather jacket and my Red Tulip asymmetrical cardigan as other options. I had mentioned in a previous post the desire to add a pair of white skinny jeans for fall/winter wear to tuck into boots/wear with booties. I have always liked the fit of Kut (perfect rise for me) and the thickness of the cloth. I'm thinking that the skinny Diana jean might be the right choice for this purpose but I'm wondering about size. For those that have do you find them TTS? Go up a size? Go down a size? It is still unseasonably warm for this time of year and I can wear skirts and dresses with bare legs - such luxury! Today I pulled out my EF Red Tulip dress - it's as if a wedge dress and a sack dress had a baby - lol! I've scrunched the sleeves a little although they are the most wonderful dolman sleeve shape and it shows better with the sleeves full length - but I find scrunching the sleeves gives the dress a bit more structure. I chose my purple-blue suede booties for footwear and went with my black leather handbag, gold mesh bangle and black/white specs for accessories. And of course, a swipe of red lipstick. Now I realize this dress is not conventionally flattering and it's a whole lotta red. No worries if it's not your cup of tea. Would love your feedback though and all comments/suggestions welcome. BTW - do you think the dress needs a long pendant necklace to break of the expanse of red or is it better to let the dress shine on its own? ETA: changed the outfit up a bit. I swapped the handbag to my small dark red snakeskin clutch and then changed the gold bangle to a chunky gunmetal one and added a chunky pewter necklace hubby gave me years ago. I think I like it better with the changes - somehow edgier IMHO. See pic #6 for updated outfit. Thoughts on which is better? I had mentioned in a previous post the need for light weight blouses for my warm office - I found this last week but it's not a blouse in the truest sense of the word. It has a wrap front with a small snap and an asymmetrical zipper on the lower left hand side. It has a hi-lo hemline and 3/4 tabbed sleeves with a slight dropped shoulder. This is the type of blouse I'm looking for (along the lines of my two new Danier tops) - something lighter weight, some interesting detail(s) and drapey to pair with a structured bottom. 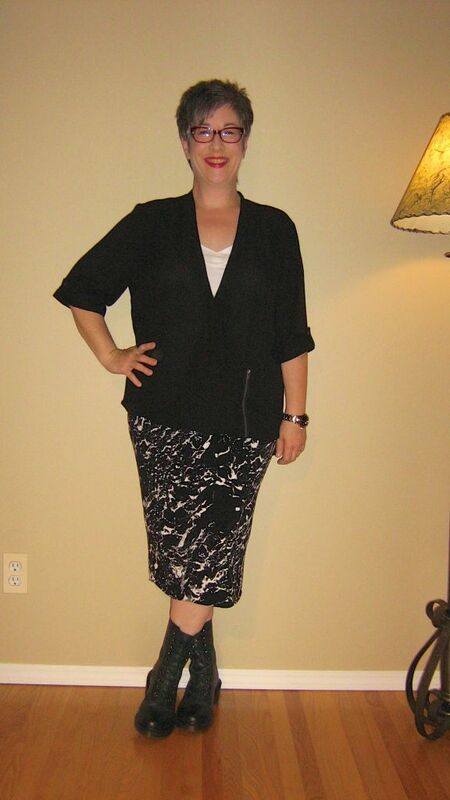 I've paired this blouse thingy with my black/white/grey marbled VC tube skirt. I popped a white tank underneath the blouse thingy to pull the white out of the skirt. 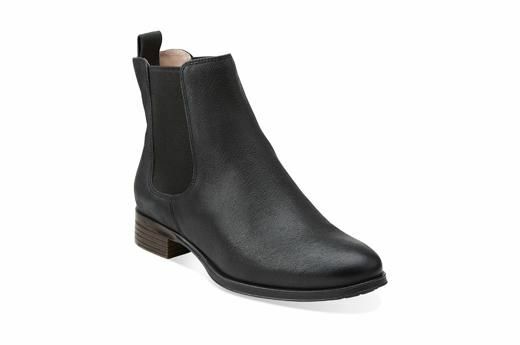 I recently purchased the Clarks Mariella Busby Chelsea boots http://www.clarkscanada.com/product/926103983/ and wanted to give you an update/review on them in case anyone is interested. First of all sizing: I would say they run a half size small. I normally wear a 6.5 and purchased these in a 7. They accommodate a medium weight sock comfortably. I have high volume feet with bunions on both and require a medium width bordering on wide toe box. These fit brilliantly right out of the box. Comfort: an 11 out of 10! They have this particular footbed that is incredibly comfortable while still be very supportive. I wore these the entire day Friday (first wearing) and had no rubbing, pinching, discomfort of any sort. I wore them again Saturday to the clinic, pharmacy and grocery shopping which involved a fair bit of brisk walking and again, incredibly comfortable. They have a fabulous "grippy" rubber bottom so there is no sliding and you feel very stable. Style: a very classic Chelsea boot with a small heel, beautiful quality leather and easy to slip on. They are slightly wide in the ankle when on (visible from the side only) but this makes them very comfortable for walking with no rubbing on the ankle and easy to get on and off. My only tiny complaint would be that the ankle of the boots is visible under slim ankle pants so there is a wee bit of bunching, but honestly, it's not bothersome. Due to the comfort of these, I am now seriously considering purchasing them in the cognac color as well and these two pairs of boots would be my primary fall/winter footwear. Today's outfit started with this wrap front hi-lo hem animal print blouse in black and cream. Underneath the blouse I'm wearing a 100% cotton light weight cami that keeps the blouse from rubbing on my shingles. I spent the better part of yesterday shortening trousers that I used to wear with my Ara patent booties. I really can't wear them anymore so figured I should make my trousers PPL with the footwear I WILL be wearing. 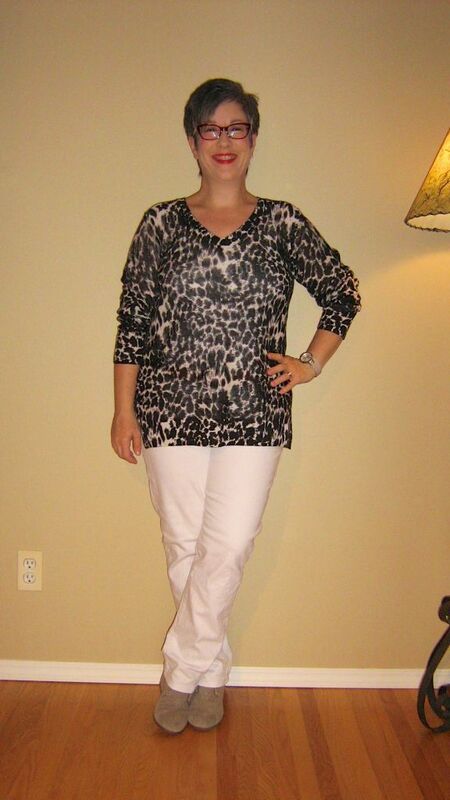 I shortened these bootcut trousers so paired them with the animal print blouse. For footwear, I chose my black leather/animal print pointy toe not-quite-flats. 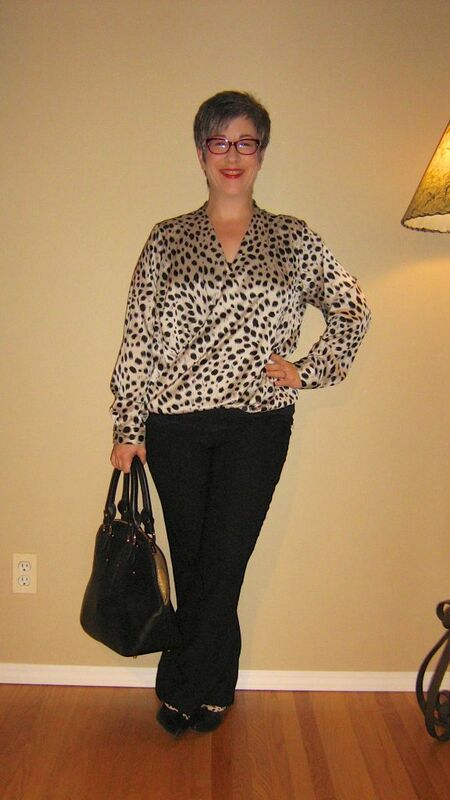 I love the little peek of animal print to bookend the pattern of the blouse - but without it being too much, you know? These trousers will also work with my new Chelsea boots. For accessories I went with my black handbag, gold wedding ring and red specs. What do you think? It's fairly simple but it is comfortable. As always, all comments/suggestions welcome. Three new items in one outfit - squeeeee!!!!! First up, is my new asymmetrical one sleeved drapey kinda-kimono-esque top from Danier Leather. I've bought jackets and handbags there for years now but never paid too much attention to their clothing once that started showing up in the stores in the last two years. Well I've now bought two blouses from there and am thrilled. Their items are slightly edgy and IMHO fit many different body types. Definitely a new clothing store on my radar. The top has a cotton-lycra full tank top underneath and then has this chiffon overlay on the top in shades of black and grey. I've paired the top with my next new item - black NYDJ jeggings with a faux suede front panel below the knee (I wish details showed up in black). They may be a little long for some folks but I quite like the scrunch at the ankle. I've popped my black leather blazer on top of that and then for footwear, my third new item. Introducing my black leather Clarks Chelsea boots….oh so comfy. To finish off the outfit, I chose my black leather handbag, silver bangle and wedding band and black/white specs. So what do you think? Does it all work together? Would love your feedback on the new pieces and as always, all comments/suggestions welcome. This is the debut of my new light weight knit black and white animal print tunic style pull over. I adore the weight of this pull over - light enough that I'm not going to melt in the overly hot office but enough weight that it feels right for fall/winter. I paired the pull over with my white BF jeans, worn full length. I tried the tunic both semi tucked and untucked and decided to go untucked today for a change. I chose my sand coloured suede wedge booties for footwear and then went with cognac for my jacket and handbag. Red specs and lip finish off the outfit. I'm loving the all neutral combination, especially the pairing of the white and cognac. What do you think? Does this all work together? Should I have gone with semi tuck instead? As always, all comments/suggestions welcome. Yep - bare legs again - this time with my black and white striped VC tube skirt. Going up to +20 Celcius today, which is positively glorious for Winnipeg in mid October. 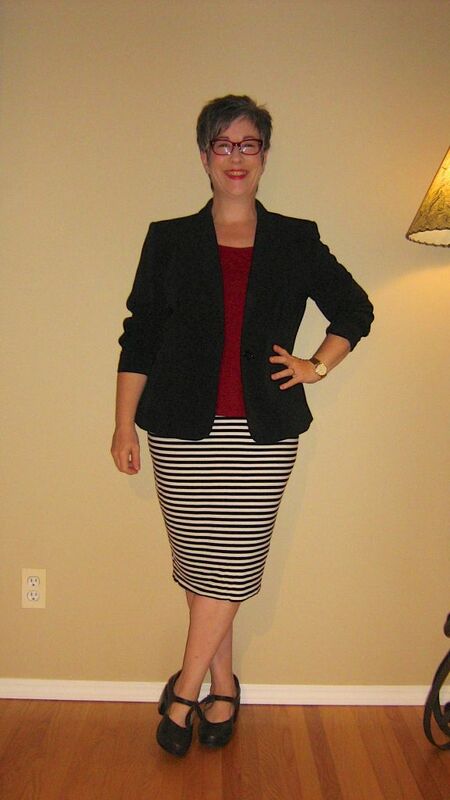 With the striped tube skirt, I have added my dark red tank and topped it all with my black suit blazer. For footwear, I went comfy and chose my Naot gun metal Mary-Jane pumps. Accessories include my red/animal print clutch for a bit more red and some pattern mixing, gold watch and wedding band, red specs and red lip. Thoughts? Does it all work together? Do the shoes look too clunky with this? I tried it on with my pointy toe pumps and I think I'm going to have to stop wearing those - lately they have really been hurting my feet. My new black Chelsea boots looked good with the outfit but will be a bit too warm for today.